The Angriest: Star Trek: The Next Generation: "Preemptive Strike"
Star Trek: The Next Generation: "Preemptive Strike"
It is 16 May 1994, and time for the penultimate episode of Star Trek: The Next Generation. Lieutenant Ro Laren (Michelle Forbes) returns to the USS Enterprise to undertake an espionage mission deep inside the Federation-Cardassian demilitarized zone. Making contact with the Maquis rebellion, she is tasked with ingratiating herself into the terrorist cell and taking it down from within. Once embedded, however, she finds her sympathies may not lie with Starfleet after all. 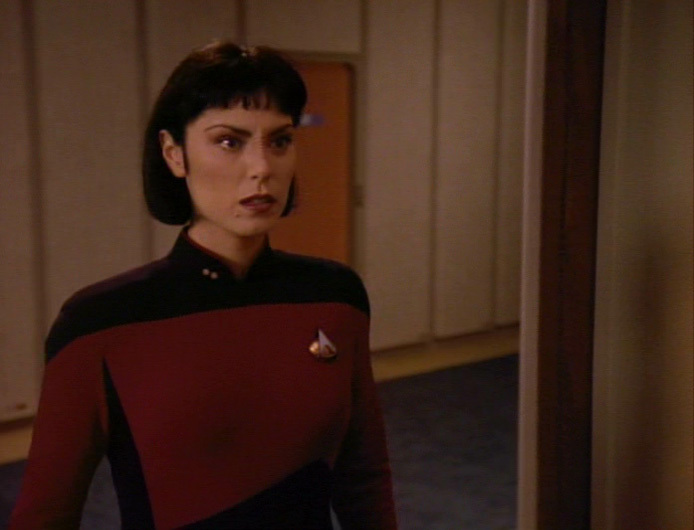 Star Trek: The Next Generation's penultimate episode acts as a victory lap for Michelle Forbes' popular and combative Ensign Ro - now promoted for her final appearance. Introduced as a semi-regular character at the beginning of Season 5 to contrast with the likes of Troi and Crusher, she was popular with both audiences and the production team - so much so that spin-off series Star Trek: Deep Space Nine was partially developed with Ensign Ro in mind (Forbes turned down the offer of a regular role, and it was rewritten as Major Kira Nerys). At the conceptual level there is a lot in "Preemptive Strike" to applaud. It utilises Ro in a smart and logical fashion, tying in her character's back story and origins to her final appearance. It relies heavily on her relationship with Captain Picard (Patrick Stewart), who redeemed her from her troubled past and coached her into a much brighter future. At the same time it provides valuable in-universe set-up for the rapidly-approaching second spin-off Star Trek: Voyager, which would lean heavily on the Maquis in its own premise. In the execution, however, the episode struggles. While it throws Ro a neat personal dilemma - side with Starfleet or betray it to her own principles - her ultimate choice rings hollow and false in the context of all of her previous experiences. She essentially betrays one father figure for another, without giving sufficient time to sell that decision to the audience. The episode is also relatively light of plot as it is, making its middle section a slightly underwhelming watch. As far as character exits go, it is not a particularly great one. That said, the acting lifts everything considerably. Michelle Forbes is always excellent as Ro, and the script gives Patrick Stewart (who also directs) a few strong opportunities to act. John Franklyn-Robbins makes for an amiable new mentor as Maquis leader Macias. On one level the episode's conclusion is remarkably bold, but if it does not ring true - and for me it doesn't - then it feels less of a natural progression and more of a stunt. Ro deserves better. After 24 episodes this season, 13 have been at least reasonable enjoyable. In all honesty, I did not realise until this re-watch just how shaky a year this final season was. The quality ratio hits 54 per cent.